The onza is a big cat reported from the mountains of northwestern Mexico. It has been described in a consistent manner from Aztec times, when it was known as the cuitlamiztli. Spanish settlers named it the onza (based on the Latin word for "cheetah") because they believed it was a North American species of cheetah. Other people thought it was a cross between a wolf and a cougar (a hybrid that can't exist). 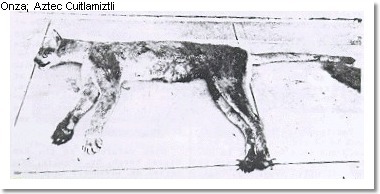 The onza was described as being smaller then a cougar, with a remarkably slender body build. It had long, skinny legs, an exceptionally long tail for its body size, and enlongated ears somewhat like a wolf's ears. It tended to have faint striping, especially on the lower legs. Those who saw it or killed it were firm in their belief that it was neither a jaguar nor a cougar, the two big cats known to roam that area. It just looked too different from either animal. The onza was ridiculed by the scientific establishment for many years, even though there had never been a serious expedition to discover whether it existed or not. In 1998, after examining a frozen onza corpse, researchers at Texas Tech University declared that the onza did exist. However, they said that it was not a new species, it was simply an odd-looking mutant cougar, at best a subspecies. Some cryptozoologists continue to hold out for the official recognition of the onza as a separate species. Several unique features suggest this, including a different hunting style and the fact that onzas have non-retractable claws, like dogs and cheetahs, not retractable claws like cougars and most other big cats. In any case, the onza is a particularly odd animal that deserves more study and ecological protection. Interestingly, recent DNA tests have overturned long-held theories about the cougar's origin. The cougar is now thought to be most closely related to the cheetah, the slender African cat that the first white colonists often compared the onza to. It is a possibility that the onza may represent, not just a regional variation or subspecies of the cougar, but the original ancestral cougar that is more cheetah-like, a kind of analog to the Red Wolf, a nearly-extinct species of wolf that some scientists think may be the original species that regular wolves evolved from. If this is true, the onza should be of a special interest to science. By studying it, we could learn much of interest about both cougars and feline evolution. Carmony, Neil. Onza! The Hunt for a Legendary Cat. Silver City, Nevada: High-Lonesome Books, 1995. Culver, M., Dratch, P., Roslund, W., Martenson, J. & O'Brien, S. Onzas- Missing Links Between Pumas and Cheetahs? Marshall, Robert E. The Onza: The Story of the Search for the Mysterious Cat of the Mexican Highlands. New York: Exposition Press, 1961.